Our dog collar brass name plates for hunting dog collars will fit dog collars that are 3/4 inch wide and bigger. 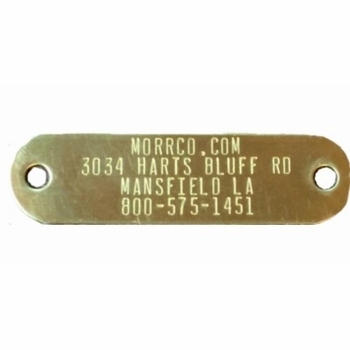 These brass name plates are 3/4 inch wide by 2-3/4 inches long. The stamped brass plate can be attached directly to the dog collar. This name plate makes your dog easy to identify. If you order the name plate un-attached, rivets are included with each name plate. Our stamping machine will stamp letters, dashes and phone numbers only. It will will not print the @ sign. If you need the @ sign you will need to order the P160 aluminum name plate or the EP165 engraved brass plate. Our stamped brass plates can have up to 4 lines. 21 spaces can be stamped on line 1 and 4 and 19 spaces can be stamped on line 2 and 3. The text on the name plate does not adjust. It is the same size for one line or 4 lines. If you put just one line of text it will be in the middle of the plate but it will be small. Most usually put their name, city, state and phone number. We will attach name plates to the collars, but no refunds or exchanges on collars with name plates attached. We attach the name plates to the center of the collar when possible.. Please call 1-800-575-1451 if you have any questions. Once they are put on they will not come off. If you are not sure about the collar size, order them un-attached. Double check your typing for errors, once these plates are printed they can not be returned, exchanged or corrected. Orders with personalized name plates usually ship within 2 to 3 working days. Lay the plate on the collar and put 2 holes in the collar where you want the name plate to be set. Stick the long part of the rivet through the collar from the top side of the collar. Put the plate back on the collar with the rivets coming threw the holes in the plate. Place the top part of the rivet on top of the end of the long rivet that is coming threw the plate and collar. Tap top of rivet with a hammer until it is set.